The Office of Residential and Commuter Life at Longwood University asked me to create something that could be used in an advertising campaign for the hiring of student staff. The initial idea given to me was something Apple themed, with possibly an iPhone being the main focus. 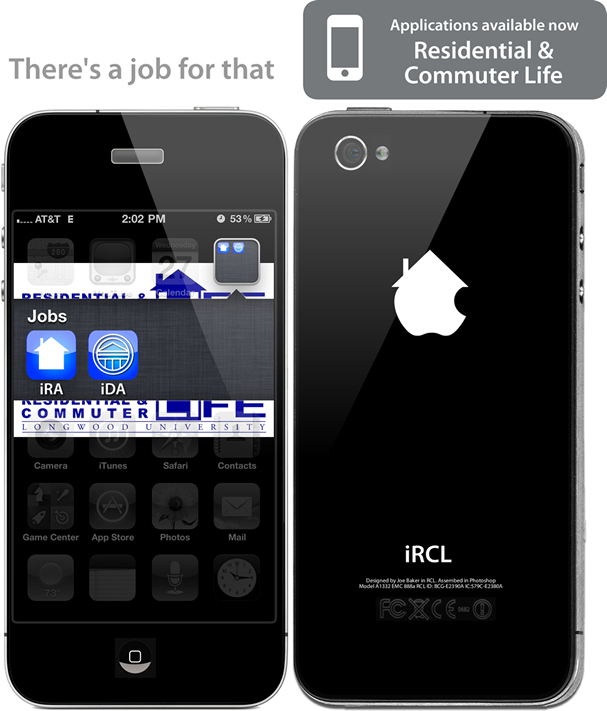 I decided to recreate the front and back of an iPhone, and reflect the positions that were being hired with two apps – iRA and iDA (Resident Advisor and Desk Aide). The logo on the back is amalgamation of a house and an apple, to combine the two concepts. I worked with a team of three other professionals, and after several drafts this was the end result. This greatly helped the department of Residential and Commuter Life at Longwood University help advertise their hiring process, and has been used on all types of media including posters, Twitter, Facebook, and the RCL website for several years.